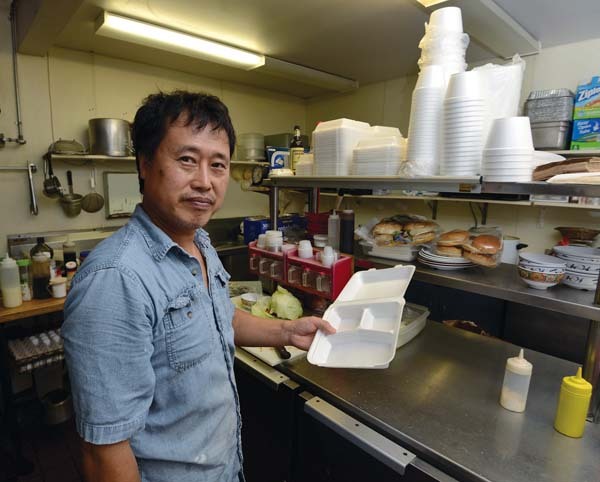 WAILUKU — The Maui County Council on Thursday evening unanimously passed a bill to ban the sale and use of polystyrene foam containers — a staple of takeout food eateries — throughout Maui County. The ban, which will go into effect on Dec. 31, 2018, now heads to Mayor Alan Arakawa’s desk for his signature. On Thursday, Maui County Communications Director Rod Antone said only that administration officials have been “monitoring the discussion” of the bill. He added that mayor is currently in Japan with Maui Visitors Bureau officials. Thursday’s vote comes after the council spent May 8 and 9 listening to 36 testifiers on the issue, as well as a panel of scientists and industry experts. Because substantial amendments were made to the bill on May 9, which narrowed the scope of the ban on foam polystyrene, the council needed to schedule the Thursday hearing and meeting to take the final vote. The amendments included moving the implementation back to the end of 2018. The council gave preliminary approval to the bill on first reading in December. 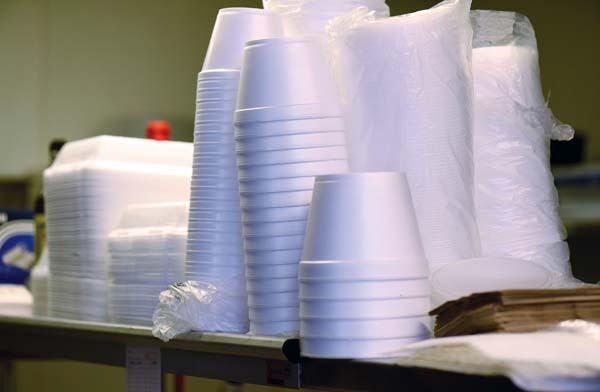 The ban now covers only polystyrene foam, identified as the white containers used to package takeout food and to hold coffee. Clear plastic and solid polystyrene are not included in the ban. On Thursday, council members also tinkered with the bill and decided to omit the phrase that polystyrene “is a suspected human carcinogen.” The amendment brought by Council Member Yuki Lei Sugimura narrowly passed in a 5-4 vote. Sugimura, Mike White, Robert Carroll, Stacy Crivello and Riki Hokama voted in favor with Alika Atay, Elle Cochran, Don Guzman and Kelly King opposed. Sugimura called for the elimination of the phrase, pointing to presentations by scientists earlier this month. One scientist said that there were no adverse health effects on humans from polystyrene and another said that the public is potentially exposed to low levels of styrene, a component of polystyrene, from the environment though indoor air, food and tobacco smoke. Sugimura was worried about legal challenges to the bill. Carroll said that environmental impacts of polystyrene are “beyond question” but was not as sure about its health hazards, noting contradictory testimony. If polystyrene is a health hazard, why has the EPA not banned it? he asked. “I don’t want to pass this bill and have it challenged,” he said. Sugimura also offered up another amendment to push back the compliance date further to June 30, 2019. She noted that when the plastic bag ban was signed into law in August 2008, it did not take effect until Jan. 11, 2011, giving businesses more than two years to make the change. “Many of us underestimate the time and effort it takes to transition away from a product that has been used for many years,” she said, adding the containers also are used in schools. Cochran, who made the motion to pass the bill, opposed the extension, saying the measure goes back to 2009 when it was introduced by former Council Member Mike Victorino. She said her staff called 21 businesses, whose officials said that the Dec, 31, 2018, gave them enough time to make the transition and that most receive weekly deliveries of containers. Sugimura withdrew the amendment after seeing that it did not have sufficient support. There are exceptions to the ban. Butchered meats, poultry, fish and eggs may be put in polystyrene containers, though sashimi and poke would not be allowed to be packaged that way. Polystyrene foam coolers and ice chests, foam blocks and packing peanuts used as protective packaging during shipping are exempt from the ban. And the director of the county’s Environmental Management Department may grant exemptions where there are no reasonable alternatives to polystyrene food containers or where complying with the ordinance will create a hardship. Those not in compliance could face civil penalties of up to $1,000 a day. Sixteen people testified Thursday with 10 in support of the bill and six against. Supporters said that the ban is long overdue and needed to help protect the environment. Critics said that the ban will hurt the bottom line of small businesses with alternative containers costing more and that the bill does nothing to prevent littering or reduce landfill disposal because the alternative containers will not be recycled.